Modern traditionalism – what a great term! Tradition and Innovation coexist strongly in all kinds of human endeavour, and quilt making is no exception. It’s very human to want to continue doing things the way they have always been done – but equally human to want to vary it a bit – or a lot. It is very interesting that in less than 10 years, the Modern Quilt Guild has rapidly taken off as a large subset of the Quilting Industry. It began as a movement of mostly younger makers juggling jobs, families and creative time deficits which led the founders to communicate online; but as other people joined them guilds began to appear to cater to a desire of people to meet locally in real time – exactly the same function of such groups in the ‘other’ older and more traditional part of the Quilting Industry. The focus of Modern quilt makers has always been to produce decorative practical home items (more bed quilts than wall quilts) which are made with the now standard rotary cut fabrics, machine pieced and machine quilted. Improvisational piecing finds a natural home with many Modern Quilters, though not to the degree I’d have thought would prevail by now, as Modern quilts still predominantly feature straight edge pattern shapes. I have been working freehand, template-free, that is, improvisationally, for over two decades now; and since I learned how to do that have always freehand cut the inner shapes of any repeat unit ( ‘block’ ) and very often the outer edge too. I love grids and how straight lines contrast with more organic lines. Modern Quilters still happily talk of ‘blocks’, and it is interesting to me that the movement has not found its own distinctive terminology to set itself apart a bit more from things traditional. While the Modern Quilt movement has brought quilt making into the lives of people many of whom have never quilted before,even though their mothers and grandmothers might have, there’s also quite a percentage who have defected from their more traditional quilt guilds and groups including some who have gone so far as to ditch their non-modern fabrics, and there are some with a foot in each camp. 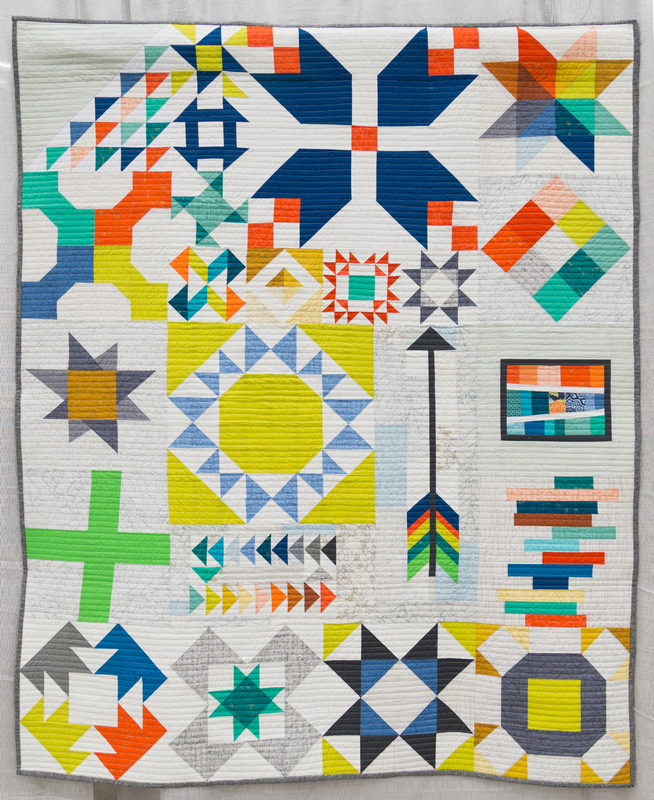 I’ve been browsing at the pics of the winning quilts at the QuiltCon 2015 exposition in Austin, TX https://themodernquiltguild.wordpress.com/2015/02/18/congratulations-to-our-2015-quiltcon-winners. By all accounts, if measured by enthusiastic crowds alone, the Modern Quilt Guild’s annual event is probably well on the way to reaching equivalence to the more traditional International Quilt Festival Houston every october. 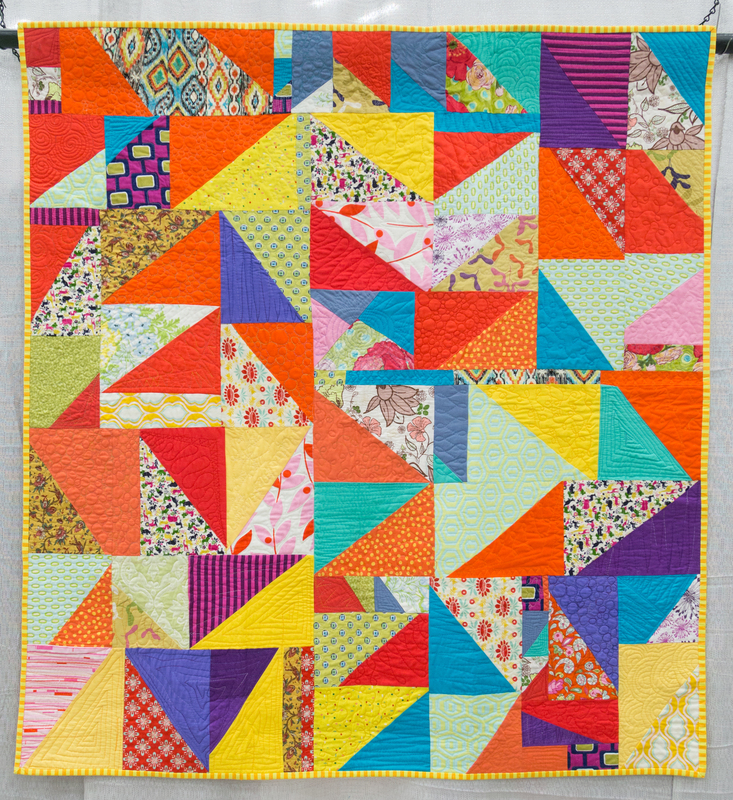 There are classes to take, vendor booths with fabrics books and notions, speakers, discussion panels, block competitions and more, with a huge variety of categories of entered quilts vying for enticing prizes with attendant prestige. 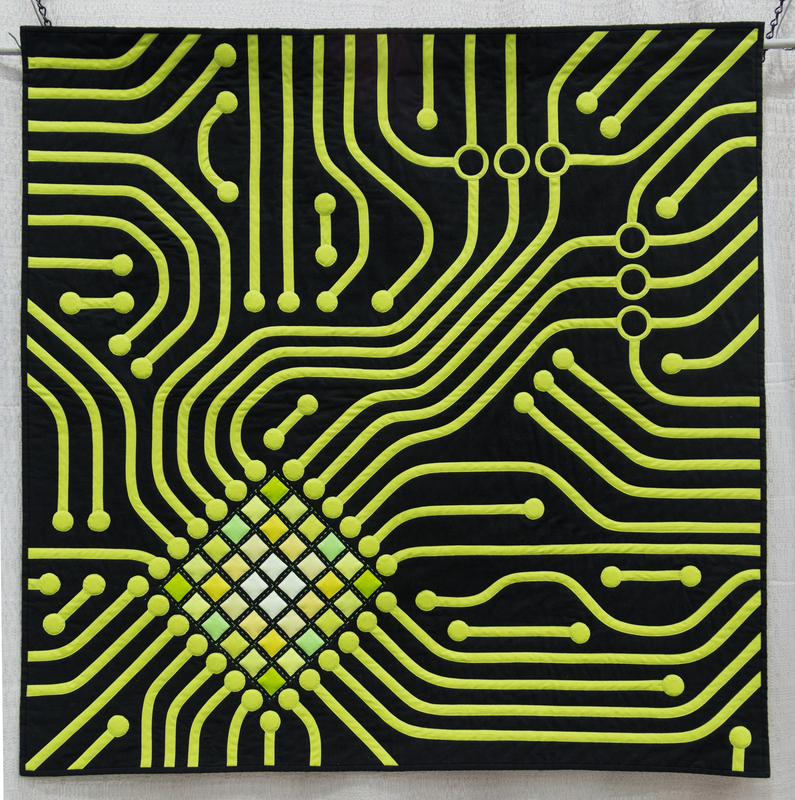 The term ‘modern traditionalism’ is one of the exhibition categories for QuiltCon 2015, and below is the winner – for a closer look go to https://themodernquiltguild.files.wordpress.com/2015/02/soper_longislandmodern.jpg It bothers me as much as most sampler quilts I’ve ever seen – only rarely are they well designed, as distinct from ‘well made’, which this one certainly seems to be. Traditionally sampler quilts are a first project in which a quilter learns how to piece or applique quilt blocks while coming to understand the basics of colour, value, balance and contrast, the quilter then learns how to set them into a pleasing layout, with or without sashings and borders. When you add the sandwiching, quilting and binding, that’s a lot of learning in that one project. 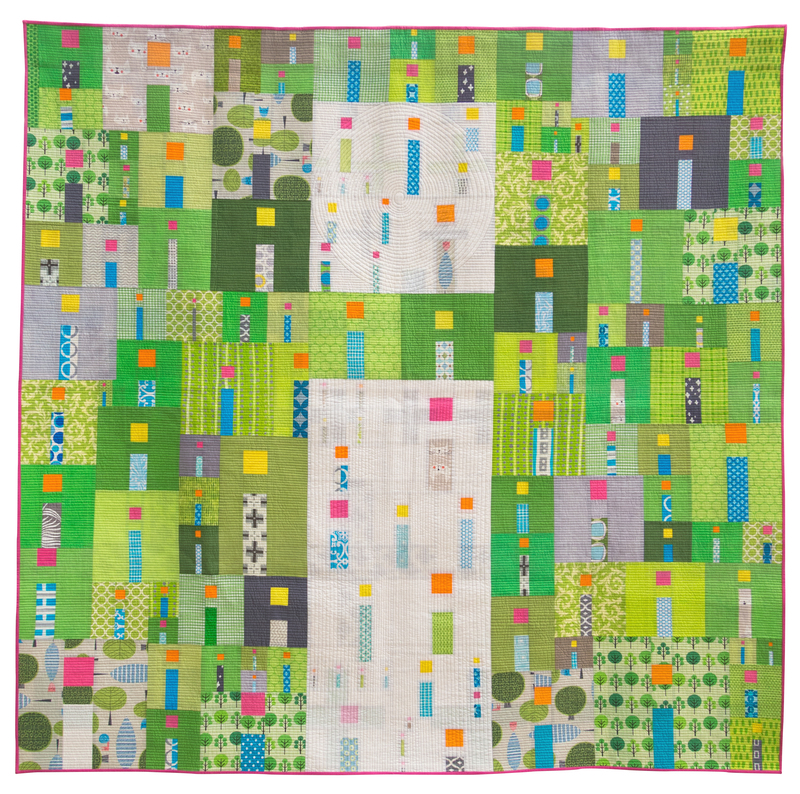 For this quilt, the addition of generous grey, white or grey/white print sashings ,and perhaps the odd empty block to surround the splashes of lovely clear bright colour would have achieved more expansive negative spaces and introduced some element of minimalism. Some blocks could have been withheld from the front and pieced into the back where they would still available as a reminder of the learning they covered. 1st Place plus a Judge’s Choice award ! Go to the Modern Quilt Guild website and there visit some of the galleries, clicking on slices/thumbnails for a complete view of each quilt. This entry was posted on Friday, February 20th, 2015 at 11:14 am	and is filed under General. You can follow any responses to this entry through the RSS 2.0 feed. You can leave a response, or trackback from your own site. what? there’s a category for bias tape?? ?